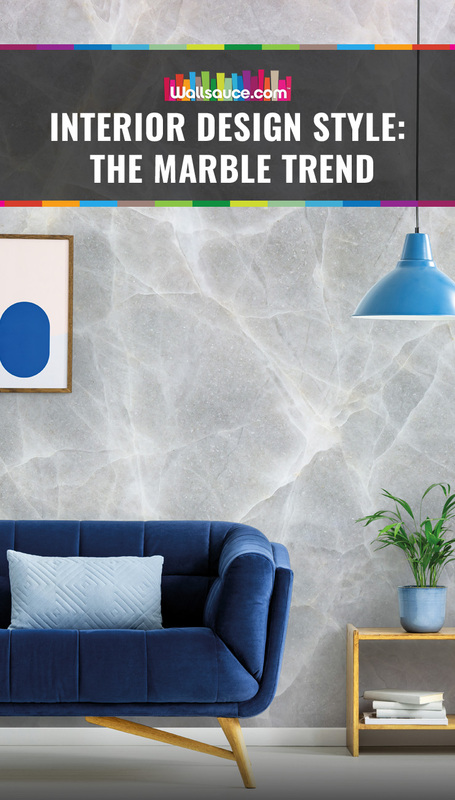 It’s time we talk about the marble trend. From walls to floors, tiles to furniture, it’s everywhere you look. 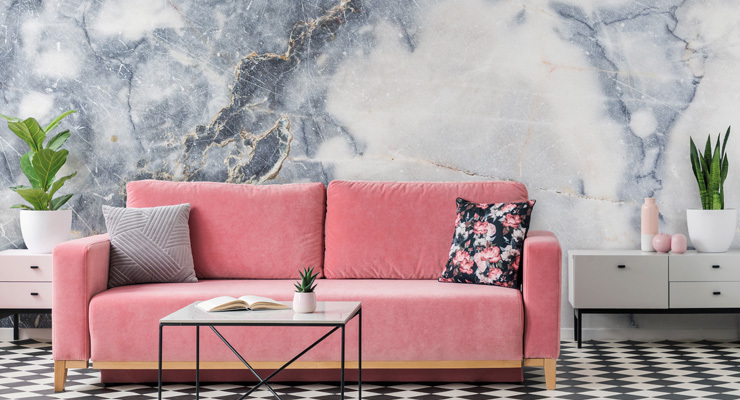 Whether you want marbled murals breathing life into entire rooms, or you just appreciate those small marble touches, this interior design style is more versatile than you think. Opt for a minimalist colour palette and you can incorporate marble décor with just about every space in the house. What’s really interesting is the staying power of this trend too, how much it has evolved, and how it has permeated everyday homes. Transported from magazine to mantelpiece, marble accessories are an easy way to inject a high-end finish with very little effort. And the finished article is utterly timeless. 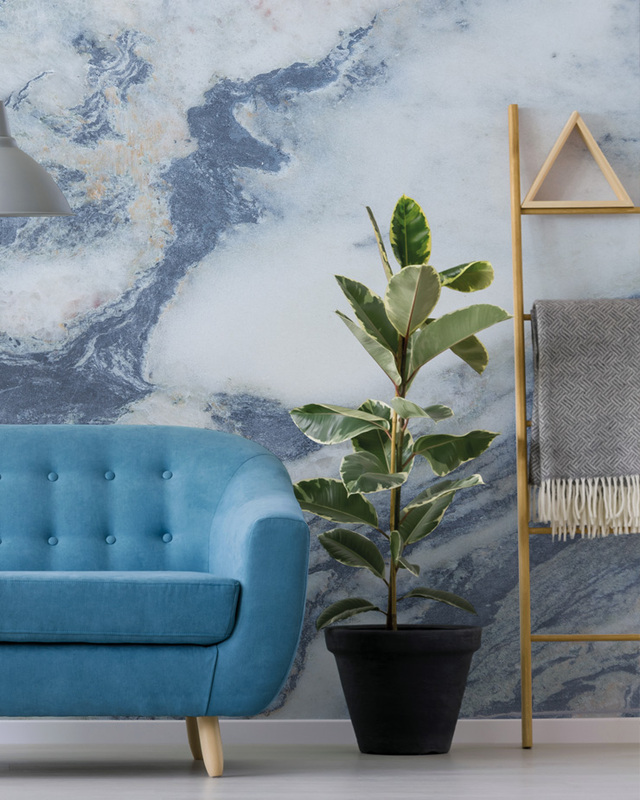 Marble is definitely one to watch in bathrooms and kitchens, but quick and cost-effective wallpaper also means that it’s suitable for every room in the house, from living areas to bedrooms. A marble wall mural can add instant luxury, and also gives you much more versatility in the way you style and decorate. If you don’t want to commit to entire walls, simply stick with small investments, like a marble clock or vase. One of the most effortless ways to achieve contemporary chic in any living space is to fuse metals with the accent colours found in the marble. Gold is a great finish for light fittings and decorative items such as tabletop accessories, photo frames and candles holders. 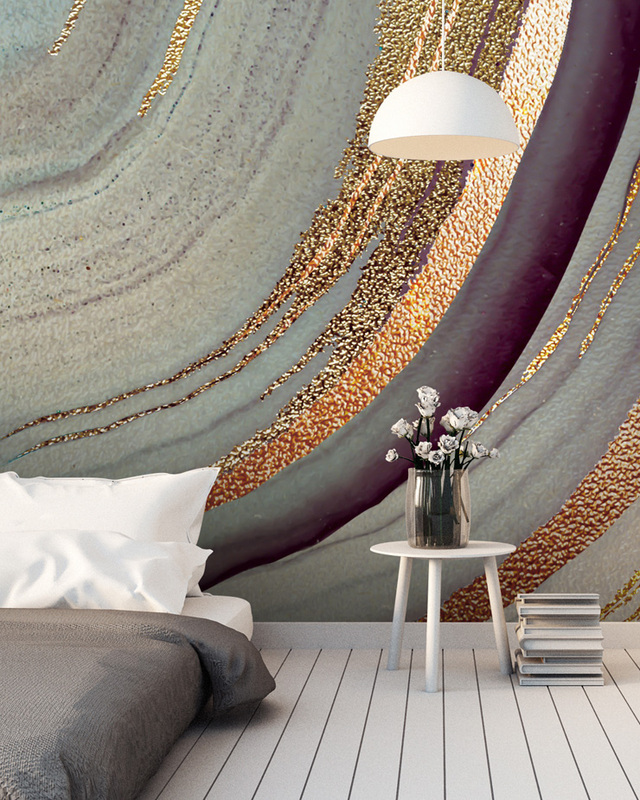 Our range of marble murals by GCC Artworks features plenty of wallpapers with splashes of majestic gold. But other metal finishes, such as cool chrome, brass and copper, instagrammable rose gold, or cast iron black, work just as well with marble designs. With marble wallpaper serving as your backdrop, you can focus on soft and hard furnishings as a way to coordinate and to create a seamless style narrative throughout the room. The versatility is boundless, with the option to ooze million dollar luxe or something more masculine like the industrial interior design styles that are so popular with homeowners. The main interior design style leading the way this year is luxury. We mean serious luxury. And marble is a match made in heaven for this trend. Whilst minimalism will always have a place in our hearts, more is definitely more in 2019. So be prepared to mix, match and clash different textures and prints. With texture, the plusher the better. With print, the richer the better. And let your imagination go wild with colour. As the minimalist craze fades into the background of interior design conversations, people are turning to marble instead of clean, white finishes. It’s the perfect answer for a muted colour palette, but with a bit of added personality. If you want to inject a sense of fun to your room, experiment with interesting hues and colour schemes. Marble wallpaper designs by new artist Lara Skinner are a fine example of how bold brights or a touch of sparkle can be mixed with something inspired by nature. 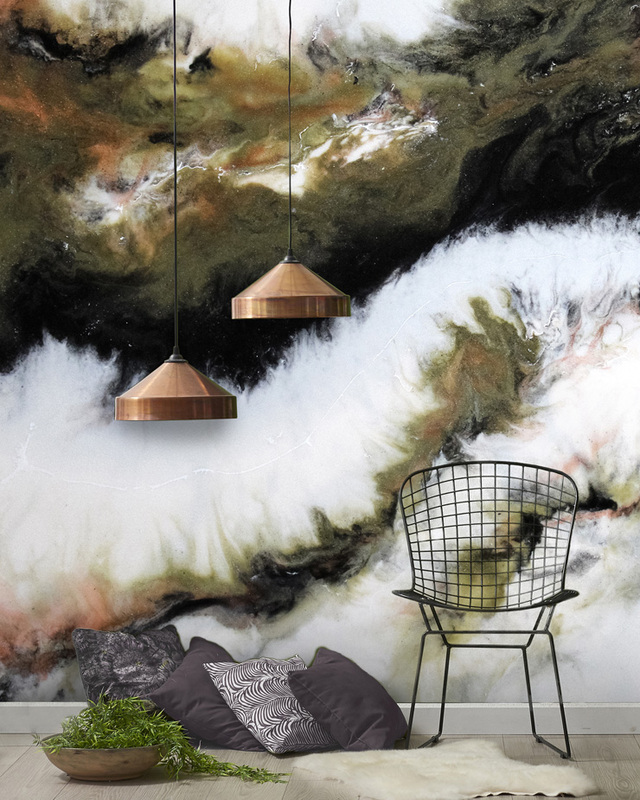 Her murals show us how ‘understated’ can be turned into a huge statement for the home. It’s not just marble design that’s taking over homes. The much-loved terrazzo tile, which drums up all sorts of retro feelings for those in the know, is making a serious comeback too. Terrazzo, which is a mosaic mix-up of marble, glass and granite is the ideal bathroom or kitchen finish for anyone who wants something different. Traditionally, terrazzo has been used for flooring only. But now it’s seen on countertops, showers, furniture, wallpaper and even prints for soft furnishings. It’s great as a stand-alone accent or mixed with other marble décor items. However you decide to style this trend, just remember that luxury is key. Choosing quality and investing in those timeless design elements not only adds to the value of your home and gives your space prominence, but it means that your design lasts much longer. It’s clear that terrazzo and marble are here to stay, and both have the ability to co-exist in the same style story without overpowering one another. Marble is an ever-evolving trend. One that’s classic yet modern, and one that’s easy to style and re-style throughout the changing seasons. As we move further into 2019, we will see the increasing popularity of green marble. From deep jade to forest greens and bold neons, this hue will take a leading role from spring through to winter. If green isn’t your colour, opt for dark marbles and accent with beautiful plants, and use luxurious fabrics to create depth and texture. Choosing a black marble wallpaper with streaks of green, and brightening up the room with bright sunshine yellow and summery palms will make an inviting living space. Some of our other favourite on-trend plants to be mixed with marble walls or marble furniture include succulents, ferns, the popular Swiss Cheese Plant, ivy plants, trailing plants, indoor moss gardens, small air plants, and the classic Ficus. But whatever plant you choose, marble provides a fantastic backdrop, giving you the perfect blank canvas for creating an indoor garden or finding aesthetically pleasing ways of purifying the air. If you enjoyed this blog post, you may also want to read our post on what else we expect to be a big interior design feature in 2019. Planning your own interior update? Or do you simply love this interior design style? Let us know in the comments below!